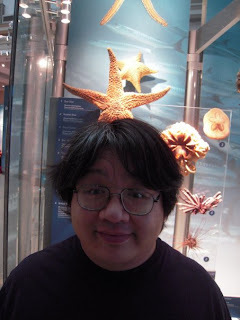 The Echinoblog: Answers from the Echinoblog!! YOUR questions from Ocean Portal and Beyond! Answers from the Echinoblog!! YOUR questions from Ocean Portal and Beyond! Today, I will answer YOUR questions that were asked regarding my recent Ocean Portal Blog via the NMNH Ocean Portal Poll on Facebook as well as questions sent to me via Twitter! So, some EXTRA Echinoblog goodness This Week! Yes! But perhaps not in the way that you would imagine. Sea stars and other adult echinoderms have what's called pentameral symmetry (although they are bilateral as larvae-that's another story though). This means that they have bodies that project outward from a central point analogous to the form a jellyfish or sea anemone might have. They lack a head and a centralized nervous center, such as a brain or a head with optic nerves, and much of their sensory apparatus is more spread out along their body. 1. There are cells located throughout the skin (i.e., the epithelium or epidermis) on the surface of most asteroids. The full range of function remains to be determined but from what is known they can detect light, physical contact and chemical/chemosensory stimuli from the environment around them. A range of sensory cells are also strongly present on the tube feet and on the margins of the tube foot groove. Some 70,000 sensory cells per square millimeter have been reported in these areas!!! 2. There is an "eye spot" at the tip of each arm that is located below the end tube foot (aka terminal tentacle) at the animal's arm tip. There are about 80 to 200 pigment cells there that form an optic cushion which can be used to detect light. As a generality, asteroids are thought to be positively phototactic, or i.e., they move towards light although species show huge variation. Tammy P. T. Dr. Mah - Have other echinoderm "outbreaks" been observed other than the one involving the Crown-of-Thorns Sea Star in Japan and Australia? Is this very common? Thank you! Yes, there are other species which have undergone "outbreak" populations but for different reasons. A recent paper (2009) in Ecological Monographs by Sven Uthicke, Britta Schaffelke, and Maria Byrne at the Australian Institute of Marine Science and the University of Sydney reported some 28 species (6 sea stars, 8 sea urchins, 10 sea cucumbers, and 4 brittle stars) that underwent large population changes. In most cases, human influences contributed to the changes in abundance/population density changes. These influences include increased nutrition/primary productivity (as in Acanthaster), species introductions, diseases (some population changes go into decline), or overfishing resulting in an absence of predators. Certain species may have characteristics that make them more predisposed to undergo population "explosions". So, even though the story and environmental conditions may differ it is possibly an intrinsic quality of differing species that may make it more likely to undergo an "outbreak". Another example of a huge population boom is in the introduced Pacific starfish, Asterias amurensis from Alaska/North Pacific to the temperate South Australian region. @oceanelements @OceanPortal Q on CoT: If on a particular dive site n 45 min bottom time you see > 10 CoTs, is that considered too many? First-one should bear in mind that numbers are relative depending on where you are and an outbreak is related to how many are perceived as occuring "normally." Based on numbers summarized by C. Birkeland and J.S. Lucas's fine book "Acanthaster planci: Major Management Problem of Coral Reefs" seeing 10 CoTS would be closer to a "normal" range. It should be noted that A. planci do have a behavioral tendency to aggregate when enough of them are around. 25 to 30 A. planci per 10 minute swim might simply be "patchy aggregation". If you are seeing 10 in 45 minutes- I'm guessing that's closer to normal. One account I read suggested that an outbreak density would be 1150 individuals(!) in 20 minutes of swim or 57 animals per minute! In contrast another suggested that an average of 0.22 starfish per 2 minute tow (presumably pulled by a boat) (=.11 starfish per minute) would be an outbreak. This latter would place your value into the outbreak range but is based on a fairly specific set of conditions that you might not be replicating. Brittle stars are somewhat similar to sea stars in that they have sensory cells in the skin (i.e., the epithelium) which covers their entire body. Although some brittle stars can detect light, this species occurs in the deep-sea and its unlikely that light or vision plays an important role in how these brittle stars capture prey. So what does that leave?? Basically smell and touch. Bear in mind that ALL echinoderms are basically big open, porous boxes that that have the outside environment (i.e, sea water) slushing around inside them. And skin covers the inside of their bodies as well! That means they can sense even the slightest change in the surrounding environment and can follow/detect molecules of attractive or offensive substances much more so than you would expect. This translates to the fact that these brittle stars can detect that big piece of shrimp "meat" very easily, even though they may not physically "see" it the way that you or I might. And once they've actually gotten their arms around it-evidence suggests that their sense of physical contact is equally sensitive. Several of them know its there because they can "smell" and "feel" it. Whew! That's it for questions to the Echinoblog this time around! Let me know! and we'll have another Q & A session in the future!! Thank you, this was cool! I have another question about ophiuroids: a few weeks back I was changing the water in my reef aquarium, and afterwards the brittle/serpent stars went wild. They started to form large groups on the highest rocks of the aquarium, raised their tentacles on high and then begun what I assume was a mass spawn! The water turned milky for several minutes. This went on for about half an hour, after which the ophiuroids went back to their usual hiding places. So, what was going on? Are ophiuroids hermaphrodites? Can I expect small brittle stars in my awuarium anytime soon? What sort of larval stage do they have? Thank you for an excellent blog, love it! Assuming this is so. Yes, what you witnessed was a spawn. There were probably some kind of cues in the water, temperature, or some other envionmental factor that triggered the behavior. Ophiuroids and most echinoderms have external fertilization. Males and females are separate with eggs and sperm ejected into the water where they fertilize in the water column. My recollection was that, as a generality, most ophiuroids are separate sexes with few hermaphrodites but not all species biology is well known. Presumably, the chances of eggs and sperm meeting and fertilizing are higher when they are present in close proximity to one another and so the close aggregations are probably one way of maximizing their chances. I'm not sure that an aquarium is the best environment to expect fertilization to occur-as many species larvae need to feed in the water column before settling out. Thank you for a very enlightening reply, a spawn it was then. It's a shame there probably won't be any baby echinoderms, but it was an interesting thing to see nevertheless.